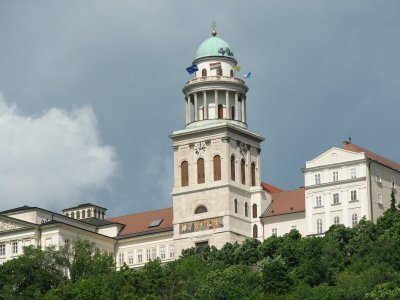 The Millenary Benedictine Abbey of Pannonhalma and its Natural Environment was the first Hungarian Christian monastery and has been influential for the spread of Christianity over Central Europe. It was founded in 996, when Hungary was primarily a pagan culture. It's an example of an early Christian monastery that still is in use. 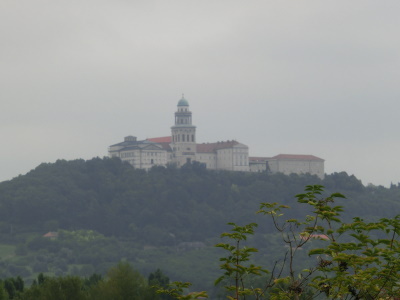 The hill where the monastery was constructed was called Sacred Mount of Pannonia, after the Roman name for this area. In the 1590's the monks left the monastery due to a siege by the Turks. Monastic life resumed in the first half of the 17th century. About 50 Benedictine monks still live in this monastery. They chiefly work in the on site boarding school. Travelling by local train from Györ, Pannonhalma monastery can be seen from afar. Amidst the grass lands a hill with a conspicuous building on top suddenly appears. I kept turning my head to look at this attractive sight, while the train slowly turned its way. This must be it! As is the case with almost every monastery on earth there's a climb involved to actually get there. From the Pannonhalma railway station it's about half an hour into town, and then another twenty minutes up to the monastery's visitor center. It's sometimes hard to estimate the popularity of a WHS - some are major tourist sites and many others are obscure monuments seldom visited by the general public. Pannonhalma fits in the first category: it has a large car park for tour buses, a restaurant and there were about 50 other visitors on my tour. The monastery complex can only be visited with a guided tour. 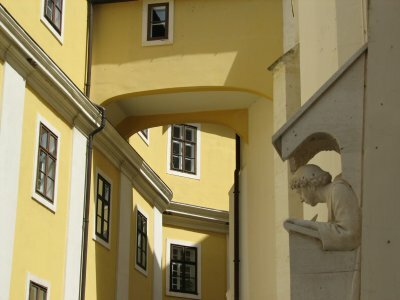 This starts off with a video in which some of the monks explain the lifes they live at Pannonhalma. Education is a big part of their life. The tour then takes us to the main building. On the outside, the 19th century tower is the most impressive sight. It has a very colourful mosaic picture above the gate. Inside the church it is rather dark, the only light coming from the glass tiled windows. The church floor has three levels: for the priests, the monks and the faithful. The most impressive part of the monastery I found its library. It was built at the beginning of the 19th century, and holds about 400.000 books. It's like a ball room for books, enclosed in cabinets two storeys high that cover all sides. The ceiling holds a portrait of Pallas Athene, the ancient Greek goddess of wisdom. This huge abbey is located on a hill outside of Györ, on the road between Vienna and Budapest. It's one of Hungary's most famous attractions, and it was swarming with tourists when I visited on a beautiful August day. It occupies an important in Hungarian history and culture, and I enjoyed visiting its historic parts, especially the library. Pannonhalma is probably not the most impressive abbey/monastery I have seen, but it is still definitely worth a visit. There are occasional buses from Györ to the abbey (and some more to the village below), but as we went there on a Sunday, we opted for a taxi instead. Most visitors seem to be on organized bus tours, as there is a huge car park next to the visitor centre that was full with coaches from all over Europe. Pannonhalma is one of those sites that I have visited mainly because it is a World Heritage Site. In April 2013, I spent a few days in Vienna and decided to make a detour to Pannonhalma. From Vienna, it is only about 1.5 hours by car. I reached Pannonhalma at 11 a.m. on a Saturday, besides me there were only two other individual visitors - and four large tour groups. There is not much I could add to the previous reviews. Thus, this review is primarily to report a recent change: since March 2013 you can visit the monastery on your own, equipped with an audio guide. I think this is an improvement, since the basilica is rather small and the space in the crypt is narrow, so that a visit with a large group is not really a pleasure. Sometimes I had to wait a few minutes until a tour group had left a certain place, but then I had the site all to myself. The audio guide is available in nine different languages and guides you through the basilica, the crypt, the Porta Speciosa, the cloister, and the library. I agree with the previous reviewers, that the library is the best part of the monastery (photo). 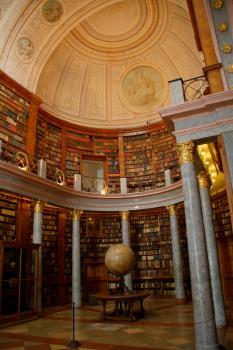 It is at least as impressive as similar libraries in Vienna, Melk or St Gall. I also took a walk to the Millenary Monument and the Chapel, both mentioned by David. Unfortunately, the chapel was closed, it is open from June to September only. All in all, I enjoyed my visit more than I initially had expected. On a hilltop, south of Györ in northern Hungary in the Roman province of Pannonia, a group of monks settled in year 996. 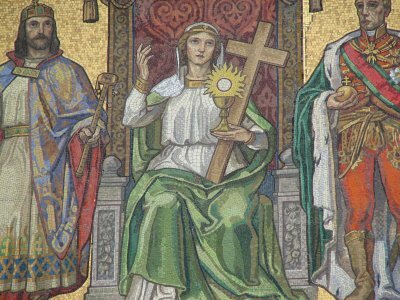 They were granted property and privileges by King Stephen and formed the monastery of Pannonhalma that still today carries on its mission today. For its 1000th birthday in 1996 the monastery was thoroughly refurbished and is now one of the most impressive historical complexes in Hungary. You can not visit the monastery on your own so joining a guided tour is a must. You will then visit the 12th century Basilica of St.Martin, see the 'Deed of Foundation', a document containing the earliest surviving example of written Hungarian and last, but not least, the monasteries impressive private library with over 300.000 volumes. And if it wasn't for a great fire in the early 19th century there would have been even more books. The monastery was one of a few actually working during the darkest days of communism and today it runs the most renowned boarding schools in Hungary. The landscape around the monastery is filled with vineyards and the sleepy little village of Pannonhalma just below the monastery offers a few B&B's and nice little restaurants that could prolong your stay for a night or two. In our trip to Hungary we have visited the abbey of Pannonhalma, founded for converting the Hungarians in 996 by the Benedictines supported by the first king of Hungary, Géza, and his son Stephen I. Then was founded the first school in Hungary and written the first document in Hungarian. There took place the peace negotiations between Papacy and Empire (11th century). It was an important cultural centre and it was reconstructed many times (in the end in Baroque style), also for becoming a fort against the Turkish (18th century). Now there is still a school and a monastic community. The church is Romanesque and have a 55 m high neoclassical tower with a dome, constructed by János Páckh. The interior is Gothic with three naves, like the crypt and has beautiful vaults and Renaissance doors. From ambulatory you can go to the square Gothic cloister, that has vaulting, springing from consoles decorated with symbolic motifs, sculptured stones and a door with red marble columns, across the beautiful Romanesque red marble portal, Porta Speciosa, with five pairs of columns. Near that is also the chapel of St. Stephen, the sacristy, with original furniture, the chapterhouse and the refectory, an oblong two-storeyed hall, projected by Martin Witwer, with nice frescos by Antonio Fossati. The archives contain unique documents and the library, built on four levels, is a neoclassical masterpiece with 350000 books and many statues. The buildings of the abbey is two-storeyed; very nice are the vaulted corridor and the row of monastic cells. Outside the abbey, on its hill, are some interesting buildings, like the chapel of Our Lady (1714), in Baroque and Romantic styles, with one nave, barrel vaults and a triumphal arch; near that is the Calvary. The Millenary Monument was constructed in 1896 for celebrating the thousandth anniversary of the foundation of Hungary and consist in a single block, constructed in brick and limestone; its porch is formed by a tympanum with a symbolic relief, supported on two pairs of Ionic columns. Around the abbey is an oak forest, that contains many floral species and song-birds, and a botanical garden, with half forest trees and plants and half hedgerow and park species, native or exotic. I liked the abbey very much because of the quality of the architecture and the variety of the styles. I think that it justifies the inscription also because of its historical importance. There are only guided tours beggining from a reception near the abbey. It is the nicest abbey in the Hungary and it is absolutely worth to be visited. The monastery is beautiful! It stands proudly on a hill above the village and dominates the whole vista. It is a long daytrip from Budapest and for the WHS enthusiast is well worth it. The only down side is that the tour is rather short and limited. It is though worth it just to see the incredible library. Pannonhalma was truly breathtaking in every respect. I visited the monastery on a cloudy March Sunday, 2004. The view of the monastery from the village below was dramatic, as well as there viewing downhill. I felt as though I was in a different world and had stepped back into time. Europe is rich in history, art and architecture compared to USA. The monastery is at the top of the must see sights in Hungary. From "Millenary Benedictine Monastery of Pannonhalma and its Natural Environment" to "Millenary Benedictine Abbey of Pannonhalma and its Natural Environment"
Introduction of Christianity: was the first Hungarian Christian monastery (996) and has been influential for the spread of Christianity over Central Europe.